This World Health Organisation report came out three years ago but is still relevant and contains information and explanations on Diabetes that are handy to have accessible at a simple click. The italics and colouring are mine! 346 million people worldwide have diabetes. In 2004, an estimated 3.4 million people died from consequences of high blood sugar. More than 80% of diabetes deaths occur in low- and middle-income countries. WHO projects that diabetes deaths will double between 2005 and 2030. Healthy diet, regular physical activity, maintaining a normal body weight and avoiding tobacco use can prevent or delay the onset of type 2 diabetes. Diabetes is a chronic disease that occurs either (Type 1): when the pancreas does not produce enough insulin or (Type 2) when the body cannot effectively use the insulin it produces. Insulin is a hormone that regulates blood sugar. Hyperglycaemia, or raised blood sugar, is a common effect of uncontrolled diabetes and over time leads to serious damage to many of the body’s systems, especially the nerves and blood vessels. Type 2 diabetes (formerly called non-insulin-dependent or adult-onset) results from the body’s ineffective use of insulin. Type 2 diabetes comprises 90% of people with diabetes around the world, and is largely the result of excess body weight and physical inactivity. Symptoms may be similar to those of Type 1 diabetes, but are often less marked. As a result, the disease may be diagnosed several years after onset, once complications have already arisen. Until recently, this type of diabetes was seen only in adults but it is now also occurring in children. Impaired glucose tolerance (IGT) and impaired fasting glycaemia (IFG) are intermediate conditions in the transition between normality and diabetes. People with IGT or IFG are at high risk of progressing to type 2 diabetes, although this is not inevitable. What are common consequences of diabetes? Over time, diabetes can damage the heart, blood vessels, eyes, kidneys, and nerves. Diabetes increases the risk of heart disease and stroke. 50% of people with diabetes die of cardiovascular disease (primarily heart disease and stroke). Combined with reduced blood flow, neuropathy in the feet increases the chance of foot ulcers and eventual limb amputation. Diabetic retinopathy is an important cause of blindness, and occurs as a result of long-term accumulated damage to the small blood vessels in the retina. After 15 years of diabetes, approximately 2% of people become blind, and about 10% develop severe visual impairment. Diabetes is among the leading causes of kidney failure. 10-20% of people with diabetes die of kidney failure. Diabetic neuropathy is damage to the nerves as a result of diabetes, and affects up to 50% of people with diabetes. Although many different problems can occur as a result of diabetic neuropathy, common symptoms are tingling, pain, numbness, or weakness in the feet and hands. The overall risk of dying among people with diabetes is at least double the risk of their peers without diabetes. What is the economic impact of diabetes? Diabetes and its complications have a significant economic impact on individuals, families, health systems and countries. For example, WHO estimates that in the period 2006-2015, China will lose $558 billion in foregone national income due to heart disease, stroke and diabetes alone. 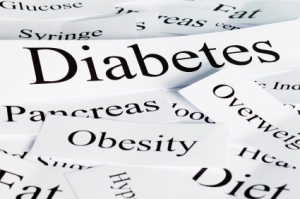 How can the burden of diabetes be reduced? avoid tobacco use – smoking increases the risk of cardiovascular diseases. Early diagnosis can be accomplished through relatively inexpensive blood testing. Treatment of diabetes involves lowering blood glucose and the levels of other known risk factors that damage blood vessels. Tobacco use cessation is also important to avoid complications. screening and treatment for retinopathy (which causes blindness); [Once a year in my case]. blood lipid control (to regulate cholesterol levels); [once or twice a year this is included in my three monthly blood tests]. screening for early signs of diabetes-related kidney disease. [once a year]. These measures should be supported by a healthy diet, regular physical activity, maintaining a normal body weight and avoiding tobacco use. WHO activities to prevent and control diabetes. The WHO Global strategy on diet, physical activity and health complements WHO’s diabetes work by focusing on population-wide approaches to promote healthy diet and regular physical activity, thereby reducing the growing global problem of overweight and obesity. I hope that everyone go’s each year for a blood check (my husband don’t he’s afraid of needle), it’s so important for the sugar level, ureum etc…Blood cells are so quick effected for the moment my white & red are no good and the doctors here wave it (I had to much scans for my bad back), yes it’s Belgium ofcourse.Lucky (for the moment )sugar & cholesterol & ureum is good I hope it stays that way.My mother had a little sugar, my father a lot (he did not listen and did not took his medicines + he liked all what was not good for a sugar patient), he died last year of sugar disase. This is clear and very helpful. My mother in law nearly died because she ignored all the symptoms for many years and would not listen to us when we told her to see a doctor. The result was she collapsed in her flat and was lying there for days. It was only by accident that she was discovered otherwise she would not be here today. Furthermore as a result she has cause long term damage to other functions in her body. So be warned! If you are concerned see a doctor. It`s always better to be safe than sorry later. Jist want to say that not all T2 is self induced -as in my case – it is inherited. I was shocked when diagnosed as I’ve never been indolent, always been active and tried to stay on the healthy side of eating – however, I’ve now learned that my maternal grandmother had T2 and it’s quite rampant on my father’s side. It iust irks me that the picture and often verbal description makes it sound self-induced – whilst realizing that poor life style can cause it. I realise you know this Robin, but some people may not. As is demonstrated in WHO report!